364. Home-made Ukrainian Lunch for $5. I saw the notice in The Villager, the local Bloor West Village weekly. “Babyn Borscht” at the Ukrainian Canadian Social Services at 2445 Bloor Street West. $5 for a traditional Ukrainian dinner with borscht, garlic bread, perogies, coffee and sweets. I didn’t know what to expect, but a Ukrainian I happened to meet said the cooks were very good and you didn’t have to be Ukrainian to eat there. Then my friend Romaine wanted to try it. She loves perogies. So we went. A sign was outside the door inviting diners inside. The dining room was tiny and cute. Its table cloths were printed with Ukrainian embroidery designs. Fortunately we got there early. 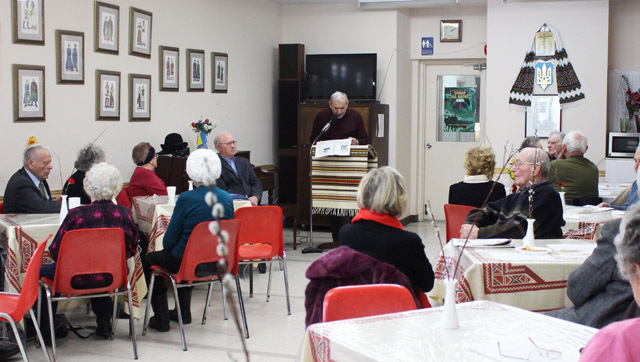 The room filled up quickly, mostly with Ukrainian seniors. Some spoke no English, but enough people there were able and willing to answer our questions in English. No problem. It was fun. Before the end of the hour, the food had run out. Alas, some people had to do without. 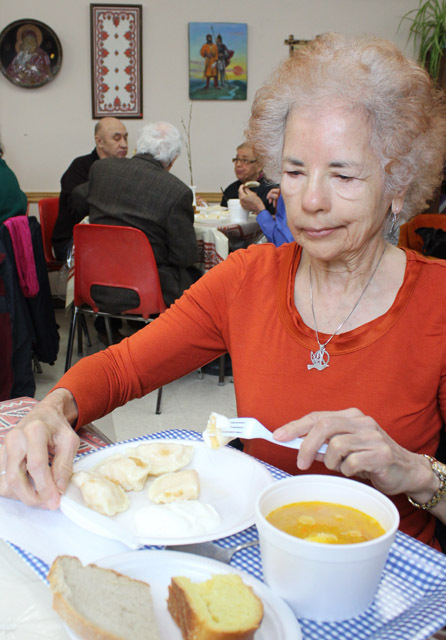 The perogies, the potato-filled dumplings with sour cream, were great. The bread was rye, no garlic. Bagels were also available, which made up for the loss. The atmosphere was charming. That day, a speaker, the author of a book on a war between Poland and the Ukraine, talked about history – in Ukrainian. We found out the lunch was offered every Wednesday. We’ll be back for sure. Later, I read in The Grid about the Estonian House Cafe located in a community centre on Broadview, It’s a gathering place for Estonians and serves “Estonian comfort food.” I’m ready to try that one next.